moxie made: spice it up. 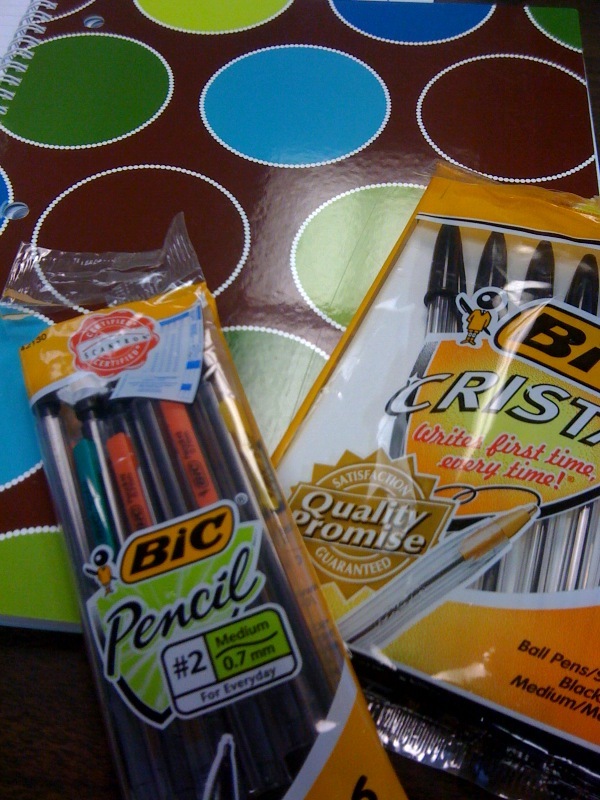 Is anyone else out there addicted to school supplies? As a kid I would choose walking through the school supply aisles instead of the toys anytime we went to Walmart. Every year as the school year gets ready to start back up I spend at least an extra 20 minutes every time we are in Walmart or Target to browse the school supplies. Well, this past week at the beach we went to Walmart and I couldn't leave without some new school supplies. I finished the last page of my legal pad at work the day before I left for the beach and I wanted to spice it up a little with a cute notebook. Soooo, I got a new notebook, pack of pens and pack of mechanical pencils. And all week at the beach I couldn't wait to open my notebook. But I waited until Monday morning. And let me tell you, it made my day! You should try it really. For just $3, a new, uber cute notebook will make your day. I love school supplies too! So did G...but the boys, not so much. I remember one time going school supply shopping. G could not wait!! B and J said "Just bring us a pencil!" WHAT?!!! I still go down all the school supply aisles....and I don't even need anything!!! Oh, and Happy day before your birthday! Just FYI- Staples is having crazy back to school specials every week. Like this week, you can get 8 BIC pens (nothing fancy or special) for a penny.